Syrian government forces and their allies now control 99 per cent of the northern city of Aleppo’s formerly rebel-held neighbourhoods, state TV says. The pro-government al-Ikhbaria TV reported that the army has seized control of the Bustan al-Qasr neighborhood and cleared it of all opposition fighters. Syrian troops backed by Russian airstrikes and militias from across the region launched a large-scale offensive on eastern Aleppo last month and are on the verge of driving the rebels from the city. Doing so would hand President Bashar Assad his greatest victory yet in the five-and-a-half-year civil war. The International Committee of the Red Cross has urged those fighting in the besieged city to do all they can to protect and spare civilian lives. 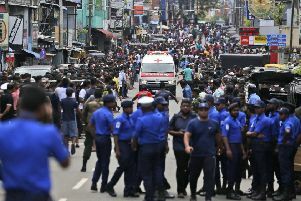 The ICRC said in a statement on Tuesday that thousands of people with no part in the violence “have literally nowhere safe to run”. On Monday, France’s President Francois Hollande pleaded for a humanitarian corridor to allow civilians to flee and get access to food and medical aid. He said France will continue to back Syria’s opposition in its fight against the Islamic State group and other extremist groups, and at the same time against the regime of President Assad. On Monday, an administrator at the last functioning clinic in Aleppo’s collapsing rebel-held enclave said he and other medical staff were taking cover in a shelter as Syrian troops move in. Mohammed Abu Rajab said in an exchange of text messages with The Associated Press that he did not know what is happening outside the building. He says thousands of people were trapped in the rapidly shrinking rebel stronghold. He said the large number of wounded had overwhelmed the clinic and that the dead and wounded were now being left in the streets. A spokesman for Russian President Vladimir Putin said the unwillingness of the United States to work with Moscow in Syria contributed to the loss of the ancient city of Palmyra to the Islamic State group. Syrian troops aided by Russian airstrikes drove IS from Palmyra in March, but the militants stormed back into the city over the weekend, forcing the army to retreat despite a wave of Russian airstrikes.